THIS ITEM IS NOT AVAILABLE AT PRESENT. WE WILL NOT BE GETTING ANYMORE Star Wars The Last Jedi First Order Snowtrooper Pop! Vinyl Bobble Head #67. From the Star Wars The Last Jedi Pop! Vinyl collection by Funko. 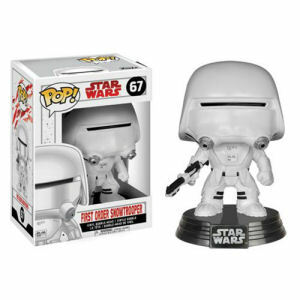 Star Wars The Last Jedi First Order Snowtrooper Pop! Vinyl Bobble Head #67. Measures 3.75 inches tall and comes with a decorative Star Wars stand.